One of the most popular beauty treatments these days is to get eyelash extensions. There are three types of lash extension sets you can get; classic, volume, or hybrid. With a classic set, it is more natural looking, but can have a little bit of drama depending on the curl and length. A volume set is high drama, and a hybrid set is a nice blend of the two. There are also different lengths, techniques, and styles of lash extensions that you can get, and of course there are a variety of different prices. Usually it will cost less to go to someone who does it themselves rather than going to a salon to get them done. I personally prefer not to go to a salon to get mine done when I do, just because I know that the majority of the cost is going to the salon and not the individual, which is also why I do not work in a salon doing lash extensions either. It is also always important to ensure the person you are going to see is professionally certified. Never go to see someone who has not been professionally trained because they most likely will not know all of the safety precautions that need to be taken when it comes to the glue and tools. Better to be safe then sorry and see someone who is certified. The first thing to know before getting lashes done is what look you are going for. Your lash technician should be able to let you know which look will be best for your eye shape, if you would like a cat-eye effect, natural, tapered, etcetera. It is also important to ensure that you are wearing no eye makeup, especially mascara, so that your lash technician does not have to remove it because the glue may not properly adhere to your natural lash. 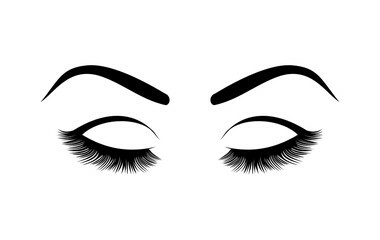 While getting your lashes done, it is extremely important to not open your eyes. The slight fumes from the glue are not pleasant and will sting the eyes if you open them. Do not open your eyes unless your lash tech tells you to. Also, do not consume caffeine if it makes you jittery before your appointment. I have had clients with jittery eyes come in because of caffeine and it makes the application a lot more difficult, and due to that, makes it a longer appointment. After the appointment, try not to get your lashes wet for about 24 hours as it may make the glue loosen and the lashes may fall off faster. It is important to also brush your lashes daily. Your lash technician should provide you with a mascara wand for you to brush your lashes which you should do when you wake up, after a shower, after a swim, basically any time you get your face wet, and before you go to bed. Do not rub your eyes or pick at your lashes, if your eye is itchy and you have the urge to rub, try to do it around the lashes. It is important not to use strip lashes on top of the extensions or use mascara. You can wear eye makeup as long as it is not oil-based and when using makeup remover, do not aggressively rub your eyes and use oil-free makeup remover because the oil will loosen the glue. When you get your lashes done, your lash technician should go over the aftercare with you. This is why it is important to go to someone who is certified, because they will give you the most accurate information on how to take care of your lashes so that they last as long as possible. Eye lashes fall out naturally and re-grow so depending on how long your natural lashes last, will also determine how long you will need to go between fills. Make sure to properly take care of your lash extensions and follow the instruction of your lash technician for how to take care of them to lengthen the amount of time they last.